Through a combination of modern-day scientific sleuthing, historical detective work, and a plethora of persistence, researchers at the University of Wisconsin-Madison have rewritten the story of a celebrated mastodon whose skeleton has been on display for a century. Two years ago, Carrie Eaton, curator of collections at the university's Geology Museum, began searching for a way to honor the centennial of the Boaz mastodon, which went on display in 1915. The elephant-like creature is arguably one of the most famous fossils in Wisconsin. Mastodons and mammoths were two of the more than 40 large mammals that roamed North America toward the end of the last Ice Age. Mastodons were smaller than their mammoth cousins, which are more closely related to modern-day elephants. Both died out in the Midwest after the glaciers retreated. Eaton visited UW Archives, looking for records that might reveal more about the Boaz mastodon's discovery and how it ended up at the university. The deeper she and UW Archives Director David Null dug, the more surprises they uncovered. "It got complicated because a couple of mastodons were found at the same time," says Null. In July 1898, Dean E.A. Birge wrote E.F. Riley, secretary of the UW-Madison Board of Regents, describing a "considerable number of bones" that had washed out of a ravine "not far from Fennimore," about 70 miles west of Madison. E.R. Buckley, assistant geologist at the Wisconsin Geological Survey, paid $75 for them because he knew "Professor (Charles) Van Hise was desirous of obtaining mastodon bones with the design of gradually accumulating enough to make a complete skeleton." Newspaper articles from that time—published in outlets like the Milwaukee Sentinel, the Wisconsin State Journal, the LaCrosse Tribune and the Fennimore Times Review—described two separate discoveries of mastodon bones in southwestern Wisconsin, just a year apart. The first was at Boaz, in July 1897, uncovered by four boys on the Dosch family farm. Buckley visited the site, detailed in his field notes the bones found there and purchased them for $50. The second was at Anderson Mills in July 1898, found after a heavy rain by young Harry Anderson on his way to the field for a day of work. Museum curator Eaton, puzzling over this information, remembered a set of intriguing photographs a visitor had shown her a decade earlier. "He came to the museum with photos of these bones from Anderson Mills, asking if we knew where they were," says Eaton. "At the time, the answer was no." The photos had been filed away, like many remnants of the past that fill the cabinets and drawers of Weeks Hall. The museum is home to 120,000 geological and paleontological specimens and exhibits that draw more than 50,000 visitors each year. Eaton dug them out: rich photographs of a spread of mastodon bones, the family who found them and Buckley himself, who was at Anderson Mills following the find. She noticed something: a piece of the mastodon's femur, at the kneecap end, was broken off. She wondered, could she find a bone in the museum with that very break? She scanned and enlarged a photograph and brought it to the specimen in the museum for comparison. But it was difficult to tell, because in 1913, as workers prepared and mounted the bones for display, they had covered them in plaster and painted over them, masking many of their superficial features. Working with museum scientist Dave Lovelace and staff at the Wisconsin Institute for Medical Research, Eaton put the femur through a CT scan, a type of medical X-ray, to see if she could find the break. 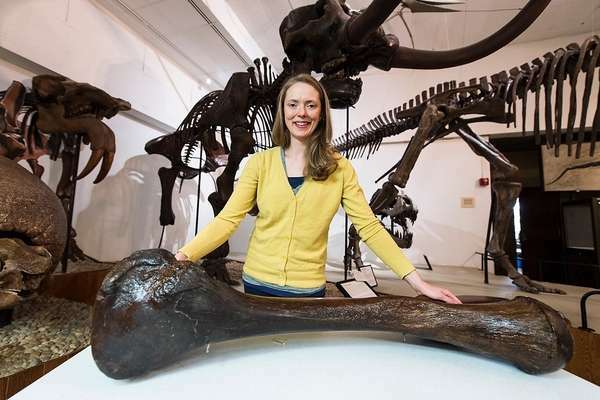 She also scanned a pair of ribs she thought might be from Anderson Mills, which had been described in the newspaper articles as "knitted" – a phenomenon caused by bone fractures that healed while the mastodon was still living. The images she got back were convincing. She then inspected the rest of the skeleton and noted how the natural staining on the elements she had scanned matched most of the other bones. Just two of the bones were notably different in their appearance: the first left rib and the right tibia. Eaton sent genetic samples from those two bones to McMaster University's Ancient DNA Centre in Ontario, Canada, as well as samples from the left femur and humerus, which were stained like most of the other bones on display. She also sent samples from these four bones to a radiocarbon dating lab to determine their ages. Her work confirmed that the right tibia and left first rib were likely from the same animal and that they are 700 to 800 years younger than the bones from Anderson Mills, which make up most of the mounted skeleton. For now, only these two bones can be attributed to the Boaz mastodon. However, the age of the Boaz bones—which date to roughly 12,100 years ago—indicates the animal could have been among the "last mastodons standing," Eaton says, placing it just before their Midwest extinction. A colleague at the Illinois State Museum, Chris Wigda, is piecing together that story. So how did the entire mastodon end up attributed to the two-bone find at Boaz, leaving the Anderson Mills discovery forgotten? "We assume both sat somewhere in Science Hall and it's possible the labels got mixed up or the material got co-mingled and they mounted the skeleton thinking everything they had was from Boaz," Eaton says. For her, the story is far from over, as the project has raised more questions she and the Geology Museum staff—including Director Rich Slaughter and Assistant Director Brooke Norsted—would like to answer. For now, the staff are planning outreach efforts throughout Dane County, teaching children more about Ice Age beasts and the "new" stories of the Boaz and Anderson Mills mastodons. This includes printing a 3D replica of the femur that provided the crucial evidence. With funding from the American Girl Fund for Children, the Friends of the Geology Museum, and the Brittingham Trust—which was founded by a UW-Madison alumnus who attended the university when the mastodon was first mounted—they are also working on a new museum exhibit. Eaton continues to try to reach relatives of the Anderson family to let them know their role in Wisconsin's fossil record. On the backs of the pivotal photographs donated to the museum is the name W. Paul Dietzman, grandson of the original J.W. Anderson, Harry Anderson's father. Dietzman, a decorated World War II veteran and UW-Madison alumnus, passed away in 2001. "I would imagine that somewhere out there are some Anderson relatives who would love to hear this story," Eaton says. "I only wish I could be the one to tell them."